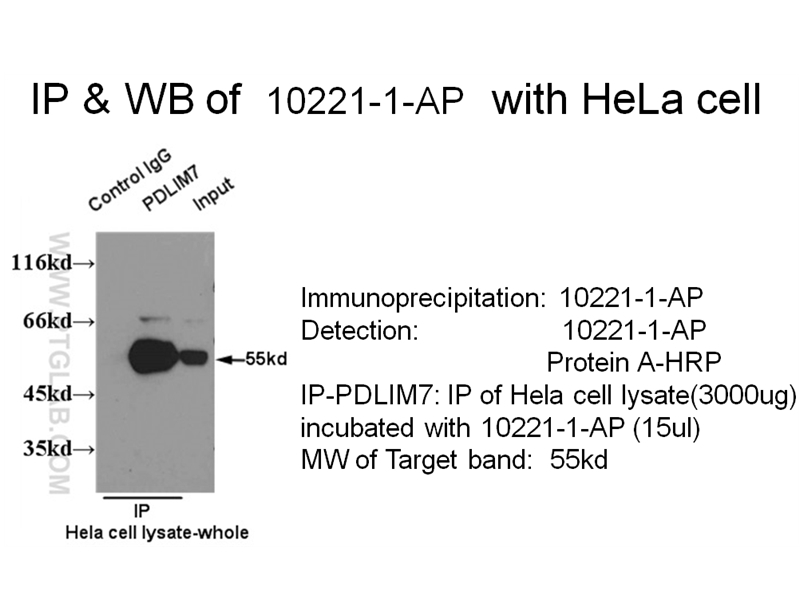 IP result of PDLIM7 antibody (10221-1-AP for IP and Detection) with HeLa cell lysate. 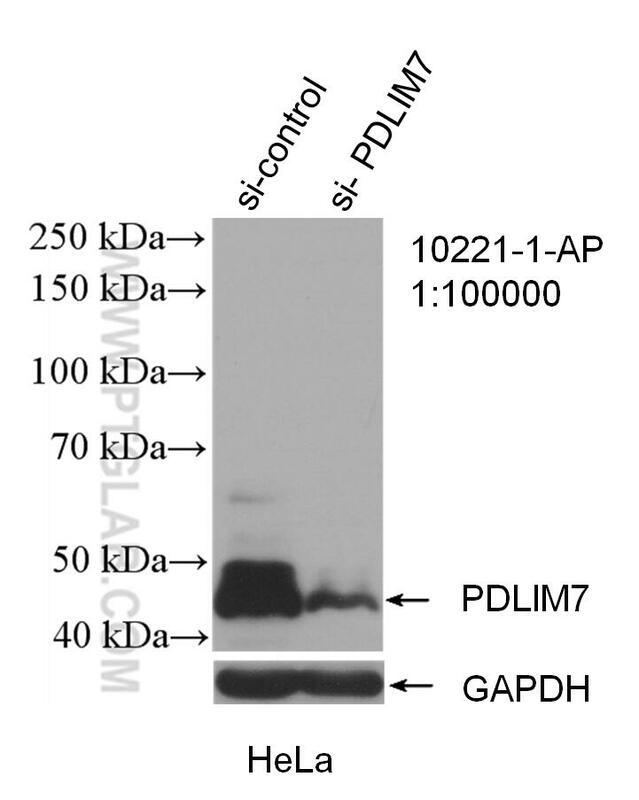 PDLIM7 (PDZ and LIM domain protein 7), also known as ENIGMA or LIM mineralization protein 1 (LMP-1), is a member of PDZ-LIM proteins which function as scaffold to interact with multiple proteins through N-terminal PDZ domain and C-terminal LIM domain. Its LIM domains bind to proteins involved in mitogenic signaling, and it plays a role in tumorigenesis by promoting cancer cell invasion and metastasis. In addition, PDLIM7 is an essential positive regulator of osteoblast differentiation and maturation and bone formation. LIM mineralization protein-1 suppresses TNF-α induced intervertebral disc degeneration by maintaining nucleus pulposus extracellular matrix production and inhibiting matrix metalloproteinases expression. LIM Mineralization Protein-1 Enhances Bone Morphogenetic Protein-2 Mediated Osteogenesis through Activation of ERK1/2 MAPK Pathway and Upregulation of Runx2 Transactivity. Salt-inducible kinase induces cytoplasmic histone deacetylase 4 to promote vascular calcification. Immunohistochemical localization of LIM mineralization protein 1 in pulp-dentin complex of human teeth with normal and pathologic conditions. Immunohistochemical localization of LIM mineralization protein 1 during mouse molar development. Proteomic profiling of human placenta-derived mesenchymal stem cells upon transforming LIM mineralization protein-1 stimulation. 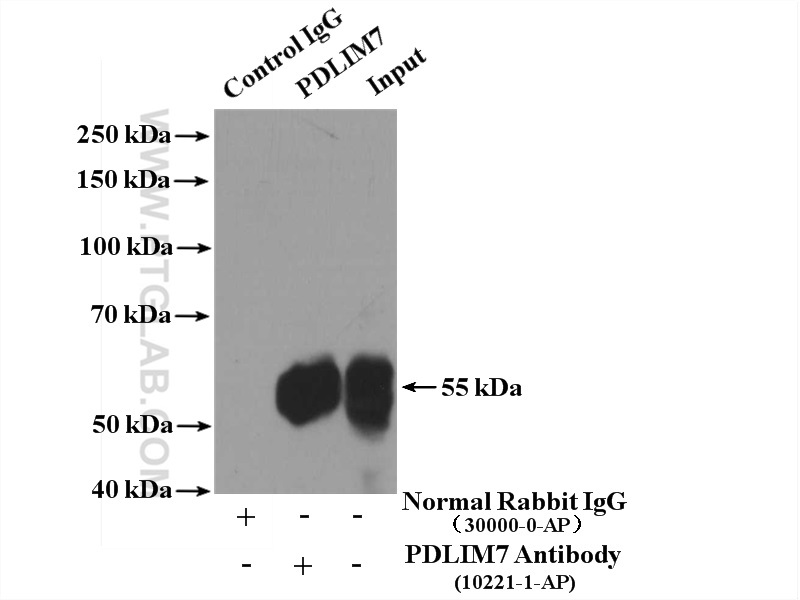 IP Result of anti-PDLIM7,LMP1 (IP:10221-1-AP, 4ug; Detection:10221-1-AP 1:300) with MCF-7 cells lysate 2000ug.